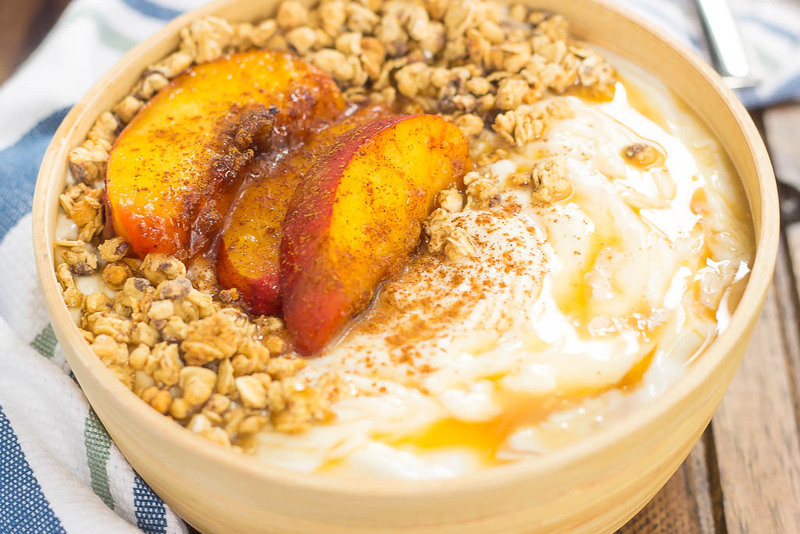 This Grilled Peach Caramel Yogurt Bowl is filled with creamy, vanilla Greek yogurt, grilled peaches with cinnamon and brown sugar, a sweet caramel sauce, and crunchy granola. It’s ready in minutes and makes the perfect breakfast or snack! Remember when I shared these Grilled Peaches with Cinnamon and Brown Sugar last week? Well, it just so happens that I’ve been making that recipe non-stop. As in several times a week, because it’s just so easy and delicious! I’ve been making those peaches for breakfast with some yogurt, and having it for dessert at night with some ice cream. Can you blame me? But, when I made these the last time, I got a little more creative. Instead of just plopping the yogurt on top of the peaches, I decided to get fancier and make a yogurt bowl. And ever since then, I’ve been hooked. Now, I’ve made yogurt parfaits before (you may remember this apple version or that berry kind), but yogurt bowls? I hadn’t thought of that before, until now. Trust me when I tell you that yogurt bowls are even better than parfaits, and just as good as smoothie bowls! With bowls, you get more yogurt, more nutrition, and more deliciousness. That makes sense, right? And with this Grilled Peach Caramel Yogurt Bowl, you can pile in as many peaches as you want, and top with some caramel sauce. Doesn’t that just sound magical? This yogurt bowl is the best way to make your mornings just a little bit sweeter. Or your afternoon snack. Or dessert at night. You choose! And it’s so easy to customize, depending on your tastes. Since I always have vanilla Greek yogurt stocked in my fridge, I decided to use that as the base. I then swirled in some caramel syrup, and topped with a grilled peach and crunchy granola. Easy peasy! 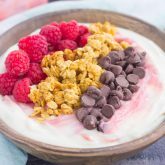 With just a few ingredients and hardly any prep time, you can have this yogurt bowl ready to be devoured in minutes. And that’s my kind of dish! 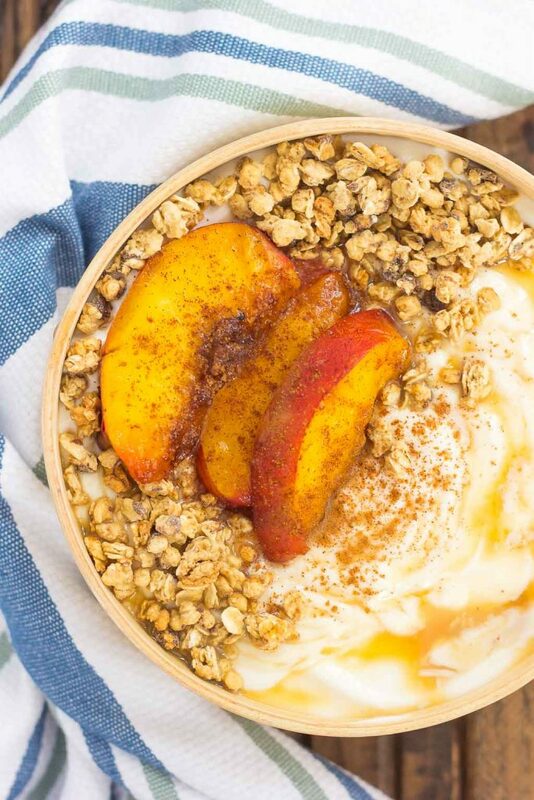 So the next time you’re looking to jazz up your yogurt, try this easy Grilled Peach Caramel Yogurt Bowl. Full of healthier ingredients and bursting with flavor, you’ll be making this dish over and over again! 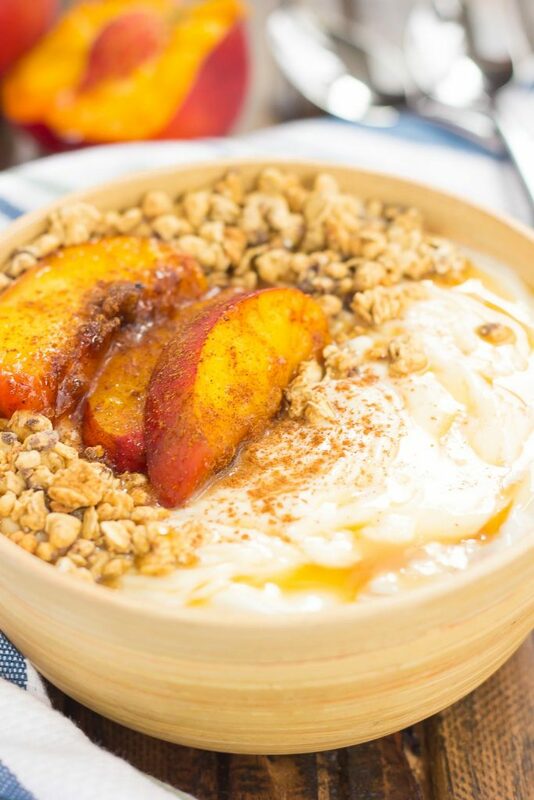 This Grilled Peach Caramel Yogurt Bowl is filled with creamy, vanilla Greek yogurt, grilled peaches with cinnamon and brown sugar, a sweet caramel sauce, and crunchy granola. It's ready in minutes and makes the perfect breakfast or snack! Add caramel syrup and gently swirl to combine. Top yogurt with grilled peach slices, granola, and more caramel syrup, if desired. I've been meaning to make those peaches, and now you're giving me more reason to just get into the kitchen and do it. Love them, and love the caramel. Such a great breakfast! Thanks, Mir! The peaches and caramel make ordinary yogurt extra delicious! You WIN at Mondays, Gayle! I mean, this bowl is everything I could possibly want today! You're also reminding me that it's been forever since I grilled peaches and I don't even know why either! Making these bowls ASAP! Thank you, Sarah! Aren't grilled peaches the best?! This does sound magical! I can see why this has become a popular treat in your house!! I'd eat it every day, too!! Pinned!! It definitely makes breakfast just a little bit better! :) Thanks, Annie! So I'm going to be honest, I'm getting a little sick of smoothie bowls... I mean a girl can only eat SO many before she needs to switch it up, right!? And THESE yogurt bowls are totally the answer to my prayers, Gayle! I love love LOOOOVE these!!! And I definitely don't blame you for eating those grilled peaches daily! Using them in this bowl is genius! Plus that caramel and granola?! OMG. GIMME!!! Pinned! Cheers, friend! Yogurt bowls should be the new trend, right? Thanks for the kind words and pin, Cheyanne! I can't blame you for making them a lot, and I get the same way when I create a recipe that I love! Eat it for breakfast, lunch, snack, dessert...until I'm totally burned out or the seasons change! Hah! This looks AMAZING! Haha yes, eventually I might have to stop eating these bowls so much! :) Thanks, Blair! I definitely don't blame you for making/eating those grilled peaches a lot -- I love grilled fruit! 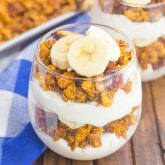 These yogurt bowls look scrumptious and are something I would love to eat for breakfast or a snack. And the caramel is such a great addition! Thank you for the yogurt love, Marcie! Oh my word, Gayle! Now THIS is breakfast! My plain old bowl of Cherrios just can't compete. This would make a great snack for the kiddos too! This is how to do breakfast right. I'm alllll over this delicious yogurt bowl! 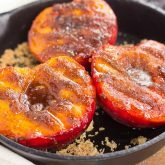 The grilled peaches are the perfect topper - I've got to try this soon while peaches are still beyond delicious. This looks incredible, and I am all about the yoghurt bowls at the moment. Especially when they are topping with delicious ripe peaches. 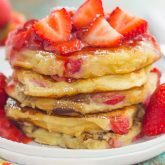 This is such a great breakfast idea! Can't get enough of grilled peaches, yum! Oh I love making yogurt bowls for breakfast or a snack, but I haven't tried it with grilled peaches. I definitely need to change that! This yogurt bowl looks fantastic, Gayle! 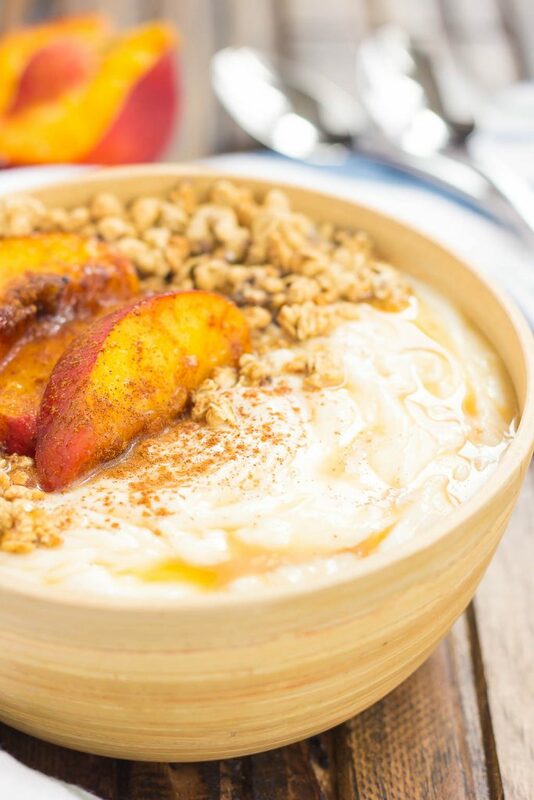 Grilled peaches are the best and I love that you piled them in this yummy yogurt bowl with all these goodies! Such a great idea, Gayle! I'd love this for my breakfast or snack any day! Thanks, Kelly! This has been my new go-to breakfast! Thank you, Stephanie! The caramel in here makes it extra delicious! I haven't had enough peaches this summer! These look awesome Gayle! Perfect for breakfast/dessert! Pinning to try it! Thanks for the kind words, Mira! Gayle, this looks like the perfect breakfast! I have been going crazy for peaches lately, so I love this. So creative to make a yogurt bowl! This yogurt bowl looks amazing! I've been obsessed with pies lately, so I can feel your pain! Once you find something good, how can you beat it? Exactly!! :) Thanks for the kind words! Wow this would be a fabulous breakfast!! So gorgeous those peaches. And caramel ugh for breakfast such a treat! !